We are the leaders in complete Do-It-Yourself Solar Heating Kits from Domestic Solar Water Heating Systems to Complete Solar Home Heating System. 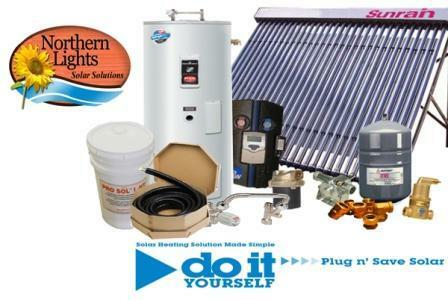 Our DIY solar heating kits products contain everything you will need to complete your project. No plumbing is required with our solar piping! 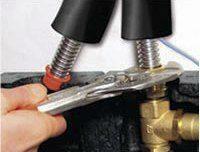 All you need are a few house hold tools such as a wrench and a drill. Our DIY solar heating kits come complete with a 110 VAC power chord that simply plugs into the a regular out let. We include the special solar high temp heating fluid that is good to -30. Also included is a special Positive Displacement Pump that attached to a regular drill to fill and pressurize the system. With modern day solar evacuated tubes you can create solar heating kits that supplies heat for hot water, home heating and even pool or a hot tub! Our detailed instruction shows you step by step how to install your system. We even offer life time technical support to all our customer! Our DIY solar heating systems arrive with every component pre-configured for Plug n' Save installation simply connect the specially provide threaded fittings to the solar collectors, working station and solar storage tank and then fill your system with the solar heat fluid and you are ready to go. For special Do It Yourself Solar Heating Kit pricing packages visit our solar heater pricing.